A boat carrying asylum seekers and migrants in the Mediterranean Sea. Six people died and 10 are still missing after a small vessel carrying 24 people capsized on Monday morning off the French territory of Mayotte in the Indian Ocean, the United Nations refugee agency reported today. For decades, people have been using small open vessels known as “kwassa-kwassa” to sail from the Comoros to the more prosperous French territory of Mayotte, according to UNHCR. Most of these movements take place without the requisite documentation and involve considerable risk to those attempting them. Asylum-seekers account for a small proportion of these movements but their numbers have been increasing in the last two years, Mr. Edwards said. 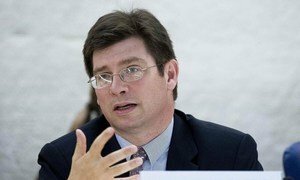 Italy must prioritize a human rights approach when dealing with migration, a United Nations independent expert said today, urging the Government to not let security concerns overshadow its border management policy.